Our test-project at a children hospital in Europe reports that for the first time in history there is a consistent zero bacteria count, and all body fluid stains are perfectly removed. No chemicals were added, just ozone. Most of the pathogens do survive easily in the temperatures above 100oC thus traditional washing techniques do not provide the necessary disinfection. Ozone in cold water cleans all light and medium soiling. There are great saving on the heating bill and the detergents. Heavily soiled linen requires a small addition of a "secret additive" that is inexpensive and 100% environment friendly. Ask for details. The discharge water is so clean that it easily meets the toughest environmental regulations. The BOD reading is well below the limit and ozone does not alter the pH readings. Where water is expensive, we can design a complete system for re-use of the discharge water. 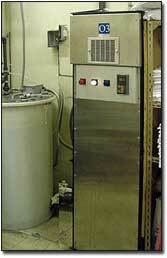 The cleaning water can be re-used up to ten (10) times and the final discharge is still within the regulatory limits. Accidentally one company have been recycling the same water for over three (3) month before noticed a degradation of the cleaning effect due to accumulation of non-oxidable minerals. Where the source water is soft, the washing cycle can be shortened up to 50%, This increases the capacity of the washing machines. Some customers may prefer more conservative approach, especially where local regulatory requirements may be quite specific. In these cases a limited water heating (up to about 45oC) and small use of detergents will not harm the process. In warm water ozone degrades faster and this is why we can not exceed 450oC. On the cold side - even at close to 0oC ozone provides much better sanitation - when compared with 100oC hot water and detergents. Ozone is not as hard on the fabric. 1. Ramada Inn - a hotel in New Jersey - reports savings of 40% ($ 4,245.-/year) on water and sewer charges, $ 4,300.-/year on Natural Gas for heating and 54% ($ 4,380.-/year) on detergents. The investment return depends greatly on the number of washing machines, because one ozone system can serve one or many machines. It was reported that even with just one laundry machine the investment return was very good. 2. Marriott hotels - at two locations: "Water use was reduced by 80%, chemicals reduced by more than 90%, laundering time reduced by 40%, and heating energy savings are 100%. The linen shows no staining and no bacterial reading, "better than ever before". 3. Beachcomber hotel in Hawaii reports $ 150,000.- savings per year with $ 99,000.- installed cost of ozone system.